A few months ago some friends and I were on our way to our annual skittles trip in Torquay, and were travelling through South Devon on a coach. Usually the driver took us along the A303 to Exeter and then south on the M5, but this year we went the scenic route (which made me feel quite sick. Not sure if it was travel sickness or the cider! ), down towards the coast to pick another team up from Sidmouth. As we got a few miles away from Sidmouth I spotted the remains of an old car at the side of the road, in a gravel parking area of a small garage. 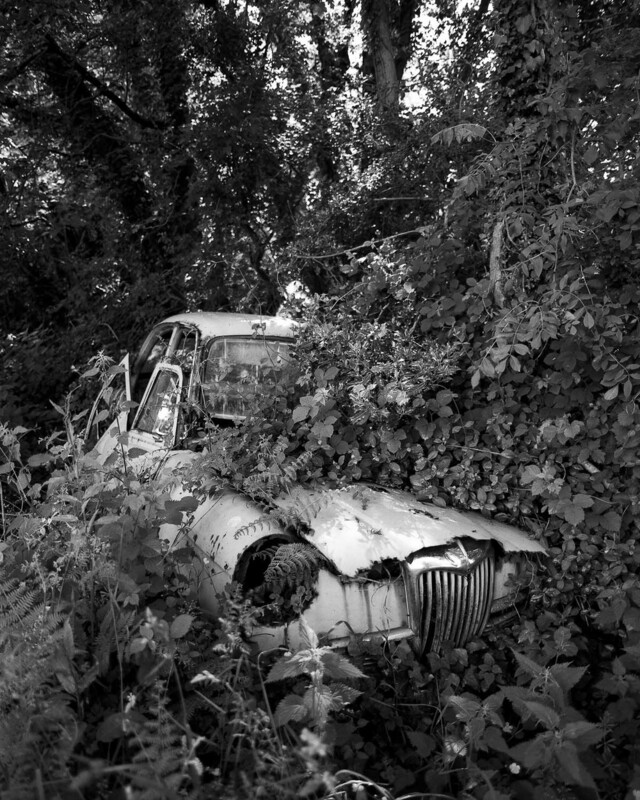 I only caught a glimpse as we passed, but I was excited to see an abandoned old car half buried in bush, and made a mental note to come back soon with a camera. About two months later Angi and I were trying to decide what to do on a Sunday afternoon, and the memory of this old car popped back into my head. We decided to make a day out of it, and went to Sidmouth first to enjoy the seaside, the sun, and a cream tea each (if you're reading this from outside of the UK, you don't know what you're missing there! ), and visit the old car on the way back. It took us a short while to find the car again, as the stretch of road was a few miles long. After a few minutes looking out, we spotted it (well, Angi spotted it) at the side of the road by the garage. We parked up in the car park and got the tripod and cameras out of the boot of the car. There was so much photographic potential for this car that I didn't know where to start. 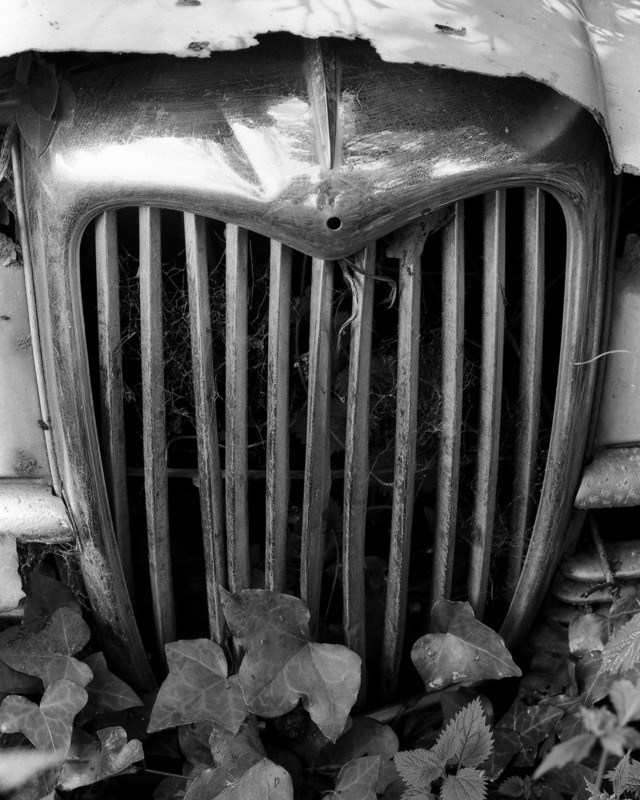 As I was using a tripod and it was a fairly bright day, I decided to use Ilford PanF 50 film on my Mamiya RB67, to create nice grainless images that showed the detail of the car and its surroundings. I was keen to try out my new 55mm lens for my RB67 as I had not yet used it, despite owning it for around 3 months. I used half the roll with my standard 127mm lens and then took some more on the 55mm, although I struggled to get close enough to the car to fill the frame with the 55mm lens. I wanted the photos to show just how badly neglected the car was, so I concentrated on taking some medium close up detail shots of the metalwork. I soon finished off the roll in the RB67 and made another mental note to come back again soon with my Arca Swiss 4x5 camera, once it has new bellows. Just need to make sure it's not another two months before I come back, although I don't think the car will be going anywhere soon! The next evening after work I developed the roll in Kodak HC-110 dilution B. PanF and HC110 (B) were a new combination for me, so I was looking forward to the results. I wanted to speed up the drying time an also remove any water marks on the film, so I added a small drop of washing up liquid to the final rinse to reduce the waters surface tension and speed the process up quite a lot. These are my three favourite images from the shoot, and as usual I've opted for a nice contrasting range of tones from full black to white. I do love a contrasty black and white photo, and I think this subject suits it especially well. Comments are appreciated as always!